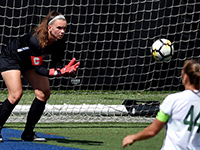 Duquesne University School of Pharmacy student Kyra Murphy broke the Duquesne University Women's Soccer career shutout record in early September. Murphy said she would consider playing soccer professionally, but her priority is earning a degree in pharmacy. She carries a 3.3 grade point average in Duquesne's highly regarded, six-year program. "People have asked me about playing pro ball, but I have two more years of school left and then I'll see where life takes me," she said. "Right now, I'm enjoying my senior season and I want to keep helping our team win games."